StarQuest Data Replicator (SQDR) is a software product that replicates data between IBM DB2, Oracle, Informix, MySQL, Microsoft SQL Server, and other ODBC-compliant database environments. You can replicate any table, portion of a table, or view. You can schedule replications to take place at specified intervals or on demand. The base StarQuest Data Replicator software provides full refresh replication, which copies all the source data that is selected for replication, regardless of when that data was last replicated. This provides a “snapshot” of the specified source data at the time of replication. StarQuest offers the separately licensed component, SQDR Plus to provide incremental replication support for SQDR users. Incremental replication copies only the data that has changed, which reduces the amount of data that is transferred and allows the replication to occur more frequently. The StarQuest Data Replicator Plus solution consists of several software components, and involves up to four systems, all loosely connected via TCP/IP. The following figure illustrates the four tiers. 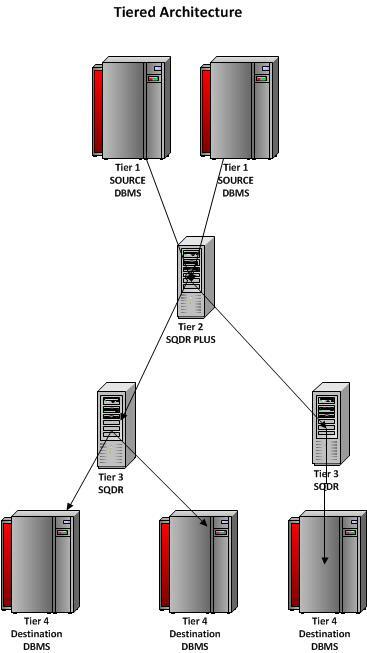 In some cases, multiple tiers may be running on the same physical server; for instance, Tier 2 (SQDR Plus), Tier 3 (SQDR Platform) and Tier 4 (Destination DBMS) may all be installed on the same Windows system. The source system contains the data to be replicated and may be a system running DB2 for i, DB2 for Linux, Unix, Windows (DB2 for LUW), SQL Server, Oracle, Informix, or MySQL. SQDR Plus Jetty service - the SQDR Control Center (SQDR Manager) web application, running under the Apache Jetty Web Server. The SQDR Plus platform can be configured and managed from any system using a browser and the SQDR Manager web application. The SQDR service is installed on a Windows system. The SQDR installation includes the Data Replicator Manager application for configuring and managing the replications and the StarSQL ODBC driver for connecting to DB2 systems (including the SQDR Plus staging database running on tier 2). This service uses a local or remote control database running on DB2 LUW or SQL Server. The SQDR installer is included in the SQDR Plus installer for Windows for simplified installation in the typical scenario where both tiers 2 and 3 reside on the same system; in this typical case, a local DB2 LUW database is used for the control database.